Read on. It isn’t hard. There are a few important—but simple to learn-- differences from the ordinary English you hear in English-speaking cities or read in the news or on the Internet. The biggest differences are the use of second person singular pronouns and verb endings, and different verb endings for most third person singular verbs in the present tense. 'You' is also the 2nd person object pronoun. In addition to “You are my friend/s,” we can say “I see you” or “I give you a present.” Possessives are ‘your’ and ‘yours’: “Is this your pen or mine?” “It’s yours.” See English Pronouns for a little more grammar explanation and many more examples. Without distinguishing you and thee, we would not know that Jesus said that Satan desired them all, but that He had prayed specifically for Peter. Many people still use ‘Thee’ and ‘Thou’ in prayer to address God respectfully. Others, especially younger people, use ‘You.’ Traditional hymns almost always use ‘Thee’ and ‘Thou’ for God. If an English speaker writes about the Creator as ‘god,’ he may well be trying to shock his readers. That might be carelessness, but it is more likely a deliberate statement of disbelief and disrespect—so it is worth taking care. Second person singular verbs end in –st or -est (usually) in the present tense (and in the simple past: wast, didst, hadest, sawest). •	Matthew 5: 36-37 “ Neither shalt thou swear by thy head, because thou canst not make one hair white or black. 37 But let your communication be, Yea, yea; Nay, nay: for whatsoever is more than these cometh of evil. •	Luke 12:58 When thou goest with thine adversary to the magistrate, as thou art in the way, give diligence that thou mayest be delivered from him; lest he hale thee to the judge, and the judge deliver thee to the officer, and the officer cast thee into prison. •	Luke 1:4 That thou mightest know the certainty of those things, wherein thou hast been instructed. •	Genesis 3:11 And he said, Who told thee that thou wast naked? Hast thou eaten of the tree, whereof I commanded thee that thou shouldest not eat? Notice also that when ‘do’ is used as a helping (auxiliary) verb, its endings are –st and –th. When it stands alone, the endings are –est and- -eth. •	Luke 13:34. O Jerusalem, Jerusalem, which killest the prophets, and stonest them that are sent unto thee; how often would I have gathered thy children together, as a hen doth gather her brood under her wings, and ye would not! •	John 3:20. For every one that doeth evil hateth the light, neither cometh to the light, lest his deeds should be reproved. ‘Will’ is the common 1st person future auxiliary, ‘shalt’ for 2nd person singular (though ‘wilt’ is also used) and ‘shall’ (usually—though not always—see the examples) for 2nd person plural and 3rd person. It’s just the opposite of more recent use. (In current use, ‘will’ is taking over, and ‘shall’ is used less and less.) ‘Should’ (as well as ‘if’) may be used as a subjunctive. When that happens in the 3rd person singular, the main verb loses its ending. •	Genesis 3:3 But of the fruit of the tree which is in the midst of the garden, God hath said, Ye shall not eat of it, neither shall ye touch it, lest ye die. We now use whoever, whatever, in (or of) which (for wherein or whereof), and wherever (for whither.) See the examples above as well as these. •	Matthew 7:12 12 Therefore all things whatsoever ye would that men should do to you, do ye even so to them: for this is the law and the prophets. •	Matthew 19:9 And I say unto you, Whosoever shall put away his wife, except it be for fornication, and shall marry another, committeth adultery: and whoso marrieth her which is put away doth commit adultery. There are several more differences in verbs in Biblical English. For example, the KJV uses ‘spake’ instead of ‘spoke’ for the past tense of ‘speak.’ Instead of ‘to hit’ or ‘to harm’ it uses ‘to smite’ (past tense ‘smote’) for everything from God sending plagues on Egypt to nations attacking other nations. ‘Lest’ means acting ‘in order to avoid’ something bad happening. There are many more old or even archaic words. 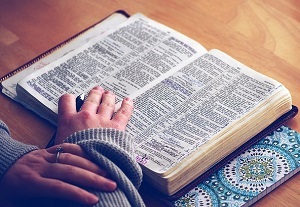 If you ever want to read the KJV, you will probably need to keep a good dictionary handy. Home> Learn English Vocabulary> Biblical English.